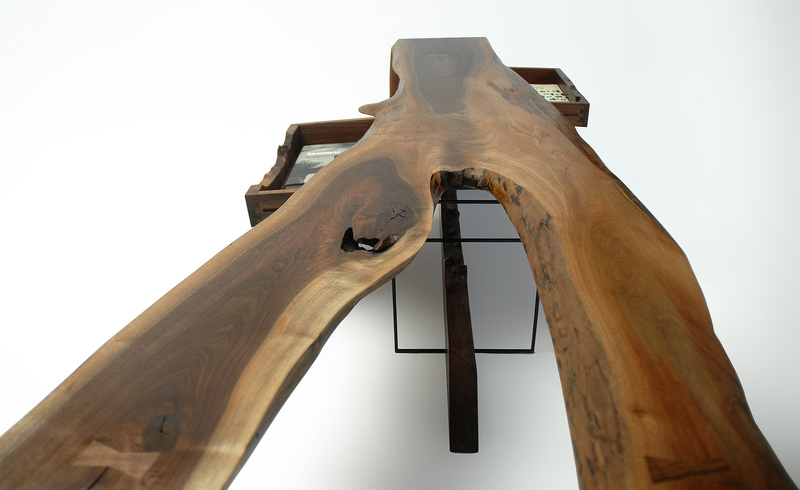 Commissioned for a recently completed residential project, the table fuses the angular and the organic in a console table of blackened steel and American black walnut. A series of steel rectangles frames and supports planes of walnut, which curve, split and cantilever in sensual junctures and appendages. Two dual-access drawers, whose facings were cut from individually selected walnut slabs, seem to hover within steel boxes. Each box floats between the horizontal and vertical axes of the top and the base, which extend in opposing directions. These two axes elongate the table’s silhouette and produce a languorous state of movement, heightened by the water-like ripples and eddies of the walnut grain. Contrasting thicknesses and close tonal values of the wood and steel accentuate the intersection of their cool and warm textures, producing a sinuous structural union of the natural and the man made.